Tokyo, 7 March 2019 – Japan Fair Trade Commission (JFTC) in cooperation with Commission for the Supervision of Business Competition (KPPU) held a four-days training course on strategic planning and management of enforcement activities from 4 – 7 March 2019. This training course was supported by Government of Japan through the Japan ASEAN Integration Fund Phase II. 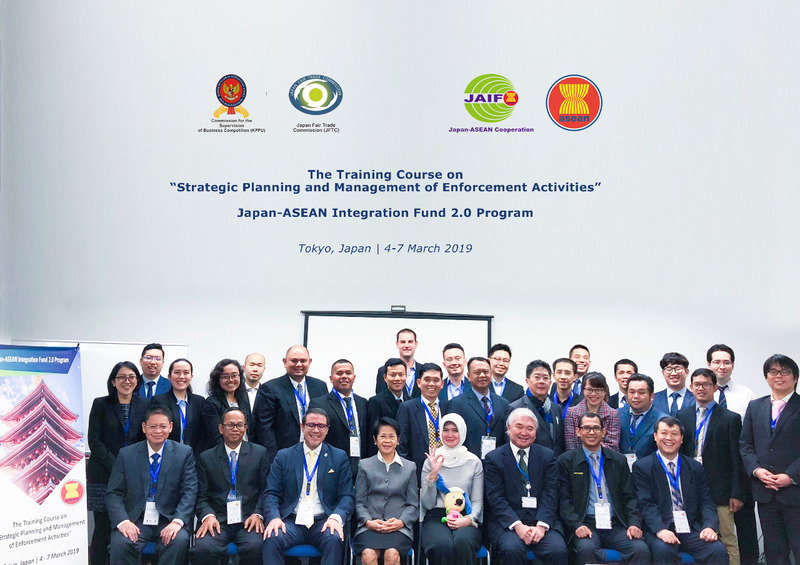 This training was aimed to enhanced the capacity of competition authorities in ASEAN and to improve the understanding on strategic planning and management of enforcement activities. There were 22 (twenty two) participants including a Commissioner and Senior Officials from the competition authorities of Cambodia, Indonesia, Lao PDR, Malaysia, Myanmar, Phillippines, Thailand, Singapore and Vietnam. This training were focusing on some subjects, such as an overview on strategic planning and management on investigation, strategic planning and management on case initiation, leniency applications, managing international cooperation in joint investigation, contructing an investigation plan, planning an effective dawn raid, interview techniques, human resource and time management, risk management and contingency plan, comparison of method of evidence gathering, preparing decision and appeal procedure, and setting up effective infrastructures (physical and non physical) for investigation. The presentations were brought by prominent speakers from Japan Fair Trade Commission (JFTC), Australian Competition Consumer Commission (ACCC), KPPU, CCCS, PCC, MyCC and UNCTAD. Mr. Sadaaki Suwazono, the Deputy Secretary General for International Affairs of JFTC, stated in his opening remarks that this training course was designed to help AMS in tackling challenges faced by competition authorities, especially in strategic planning and decision making for enforcement activities. Mr. Suwazono hoped that through this training, AMS will have much to discuss based on the experiences they shared with each other.